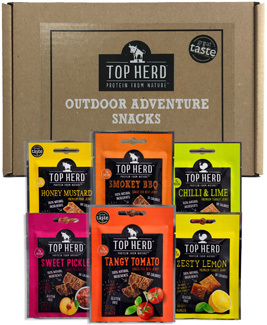 The package offers a price advantage over individual orders and includes the complete selection of Top Herd Jerky. Thanks to the attractive box also ideal as a gift. 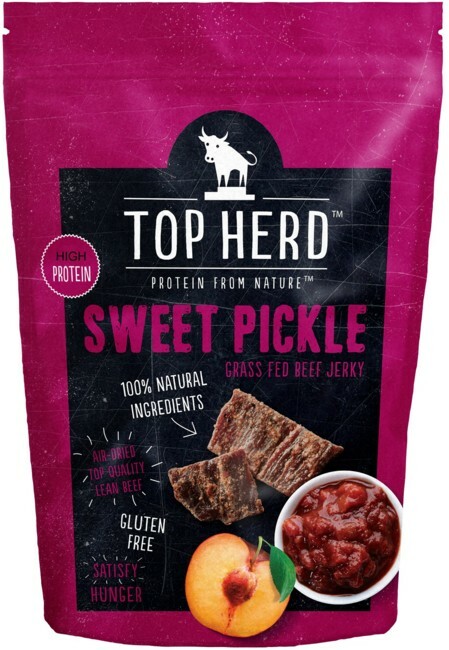 Beef Jerky, spicy marinated in smoky hickory BBQ sauce! 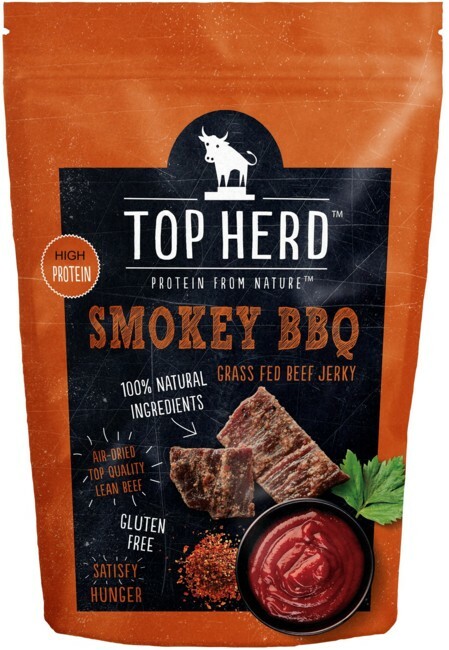 Top Herd Beef Jerky is made exclusively from premium beef from grass-fed cattle from small, family-run farms in the Austrian Alps. 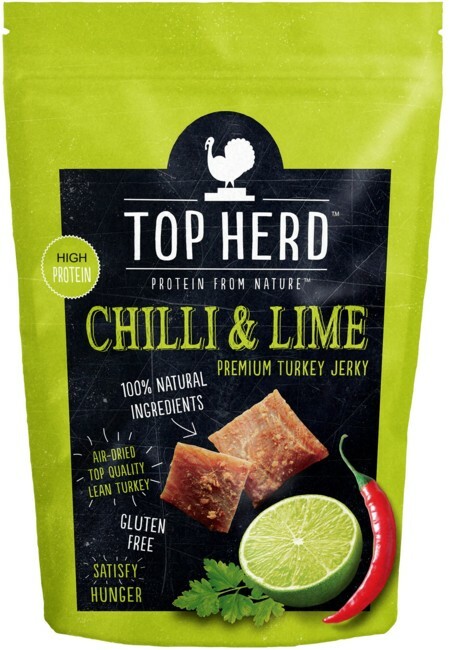 It is marinated for up to twelve hours in carefully selected spices and herbs and then traditionally air dried. 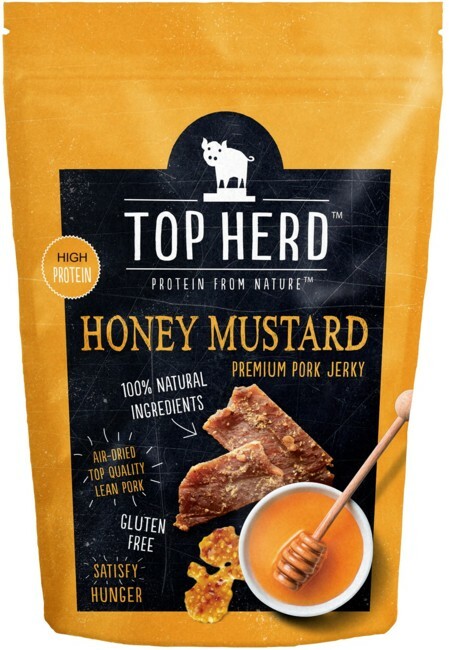 Don't be a nerd, be top of the herd! 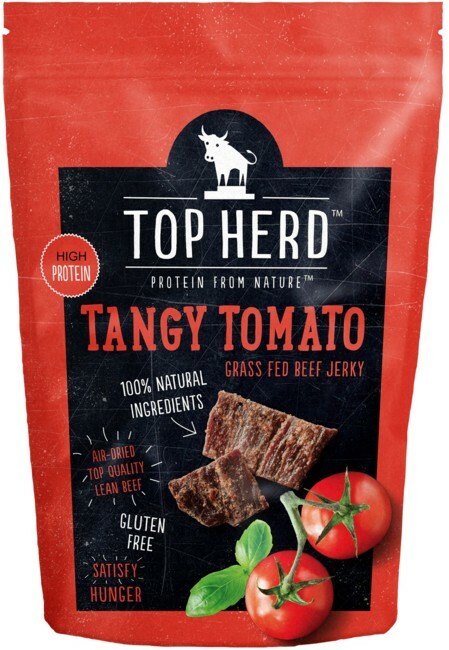 Beef Jerky, tastes like a real beef tomato! 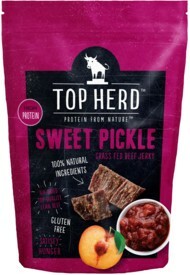 Beef Jerky, very British - marinated in Ploughman's Pickle! 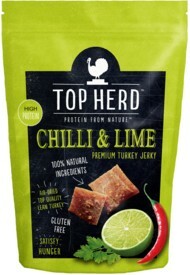 Turkey Jerky, tender meat snack with fresh lime flavour! 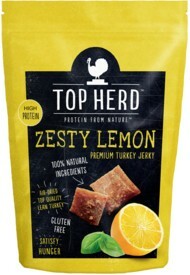 Top Herd Turkey Jerky is made exclusively from premium turkey meat. The turkeys are farmed according to high European standards. The meat is marinated for up to twelve hours in carefully selected spices and herbs and then traditionally air dried. Turkey Jerky, taste adventure with garlic, basil, honey and juicy lemon! 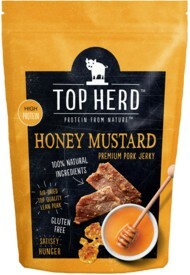 Pork Jerky, marinated in mustard and honey - refined with red wine! Top Herd Pork Jerky is made exclusively from premium pork from small, family-run farms in the Austrian Alps. It is marinated for up to twelve hours in carefully selected spices and herbs and then traditionally air dried. Low-fat salami sticks, delicately flavored with tomato and smoked paprika! 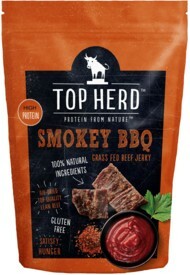 Top Herd Skinny Salami is made exclusively from premium pork from small, family-run farms in the Austrian Alps. 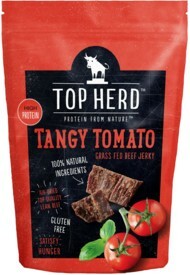 It is marinated for up to twelve hours in carefully selected spices and herbs and then traditionally air dried. Low-fat salami sticks, with all the hotness of chili pepper!